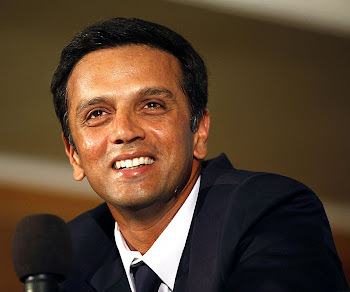 Rahul Dravid: Review system: A Curse on Rahul? Review system: A Curse on Rahul? Just before the start of test series against Srilanka, it was Rahul Dravid who was impressed with the umpire referral system, probably because he was unaware of what is coming next. Rahul was the one who was given OUT after review for 4 times out of the 6 innings he played.One of these dismissals was quite correct, but the others were under the scanner. Mendis to Dravid, OUT, Another review for a bat--pad catch! The two-fingered googly is the answer. What a bundle of mystery. Indians better call Hercule Poirot to solve it. It turned in from the middle stump line, Dravid was sucked forward to defend but the ball broke back in to take the inside edge before popping up off the pad to short leg.. The umpire had turned it down and Mahela was quick to do the T symbol, the time-out signal. What a session for Sri Lanka. Magical. Indians were clueless out there. Mendis to Dravid, OUT, Another failure for Dravid. The wall is cracking from side to side. It was the quickish off break, Dravid was on the front foot, looking to defend. The ball turned from outside off stump, collided with the inside edge and went to short leg who juggled with it before holding on. Two quick wickets. Mendis leads Sri Lankan fight back. Wonderful Test match. Hold on, some drama regarding Dravid's dismissal. The ball popped off the short-leg fielder, hit the right shoulder and then rebounded off the helmet grill before he caught it again. LAW 32 (Caught) - Section 3 e fair catch -A catch shall be considered to have been fairly made if a fielder catches the ball after it has touched an umpire, another fielder or the other batsman. However, it is not a fair catch if the ball has touched a protective helmet worn by a fielder, although the ball remains in play. anyway that's that. Muralitharan to Dravid, OUT, Review for the lbw. the off break around the off stump, Dravid goes for the sweep shot, misses and is struck on the pad on the off stump line. Mahela has a chat with the umpire and asks for the review. He was struck on the pad, just inside the line - more than half of the ball was inside the mat. He had taken a big positive stride down the pitch when the ball made contact on his pad but the ball was turning in to the stumps.. Decision still pending. What is going to be? Verdict is OUT. Dravid is not too happy as he storms off. He banged the bat on the ground as he walked off. Prasad to Dravid, OUT, loud shout for lbw. Mahela has asked for the review. It landed on a length outside the off stump, came back in with the angle and was hit in front of the off stump line. Almost 40% of the ball was inside the mat around that off stump. Dravid had pressed the front foot too much across and couldn't get his bat around it in time. Decision still pending. Doctrove is the third umpire. Benson is talking with him. And the verdict is OUT. The virtual eye suggests it would have hit the off stump. In the recent times Dravid has been troubled with his trigger movement - he has been pushing that front leg too much across. The three dismissals (written in italics) were discussed a lot afterward.Out of these 3 dismissals, 2 came at the time when Rahul was looking all set for a ton, specially the one when he got out on 44. Let us hope that Rahul's career does not get affected due to such incidents.